Unsurprisingly, given the name of our organization, I’m very bullish on participatory budgeting programs, specifically the excellent national PB Project based in the Bay Area. The research – especially internationally – on PB’s increase in community equity is robust (thanks Tiago & Hollie & others) – and in NYC, it’s made a huge local impact with the forward-thinking NYC Council leadership and our dedicated local PBNYC team. I think PB should be a strong component of any responsive local government, and we can spread it to far more municipalities through digital & #opengov & #civictech networks. Our non-profit PPF is proud to be on the Host Committee for tonight’s benefit of the PB program nationwide (#PBParty on Twttr) – along with the awesome Silaka Cox of the Rockaway Youth Task Force, and with much-needed support from the Democracy Fund. NYC’s PB program should hopefully grow even further from the 24 of 51 Council members’ offices who participated this past year. Lots of good news coverage out there of the results. $4,500 – Develop or integrate a free online tool for pitching PB directly to local officials. We’ll work with partners and software developers to integrate “contact your local official” tools on our website, so that anyone can write, call, or tweet at their local officials. We’ll also develop sample messages, tweets, and phone raps to help focus your organizing efforts. Last year, you decided to fund version 1.0 of the PB Organizing Toolkit– now help us get started on version 2.0! 2. Follow the link on that page to their official Donation page, and enter a gift in the amount of your choice – they do incredible work on a shoestring budget, I can vouch. 3. The email address you submitted with the donation will immediately receive an email from PB Program w/ a link to go to a Google Form, where you can vote for up to three of the nine projects, hopefully including ours. A. Enter her ZIP code (and in some cases, her street address) and see her city’s mayor and city council member (or other local elected officials). This geo-location is a unique AskThem feature, build on local open-data for even more powerful & interesting remixes in the future by any developer. B. 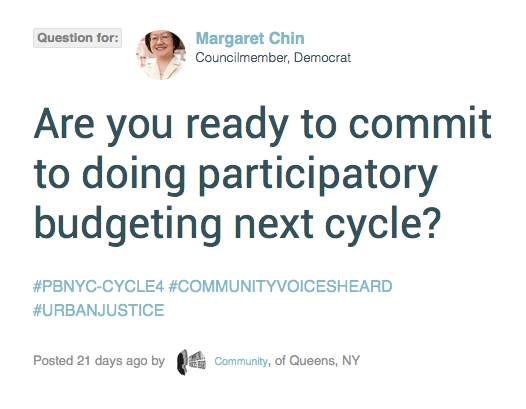 See a well-written question about whether her elected officials will join a local PB initiative in her city, with relevant resources & rich media & editable text for personal stories of support, ready to publish. C. Send it through to the AskThem platform to host & spread, for further sharing with neighbors, online delivery to city government offices, and tracking its status as it receives an official public response from council staffers. 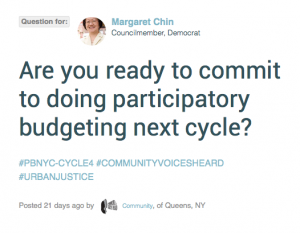 More examples to come – I’m very excited that this work will build on the free AskThem widgets we developed with support from the Knight Prototype Fund and our partnerships with Community Voices Heard and other NYC community groups. Questions & feedback welcome, david at ppolitics.org. Go PB program.